We know that many of you have made New Year’s resolutions (or Spring Break or Summer or…) to make this the year you get into the best shape of your life. We are here to help you do that. It cannot be done without focusing on your nutrition just as much as your workout plan. You can be in the gym 7 times a week and still not reach your goals if your diet is not on point. The good news is, a proper diet can be delicious and satisfying, without gimmicks or starvation. We have spent our entire lives managing our weight, first as wrestlers and now as MMA fighters. In recent years, we have both worked with nutritionists to learn the RIGHT way to stay lean and mean (and as a fight approaches, cut weight in a healthy manner). We now want to share this knowledge with you in order to help you reach your goals. 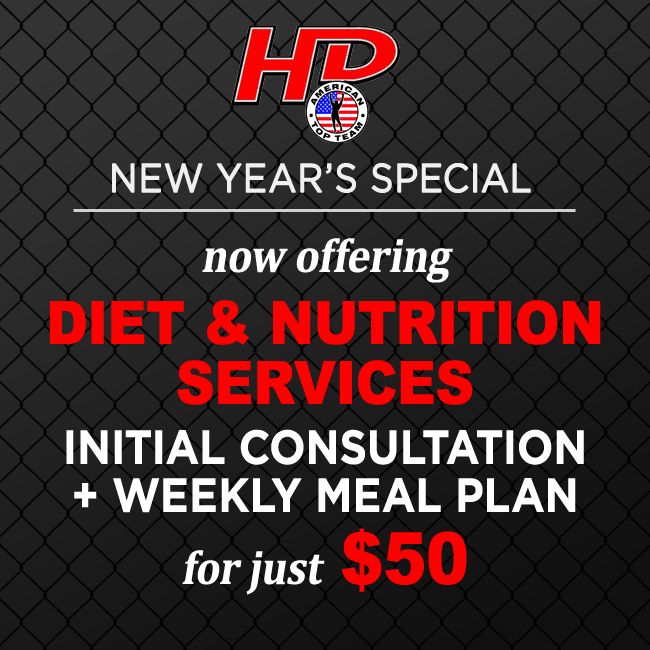 We are now offering an initial consultation and write-up of a weekly meal plan customized for you for just $50. Come into the gym and find one of us, or set up an appointment (Contact us HERE). Let us help you reach and keep your resolutions, whatever the time of year!